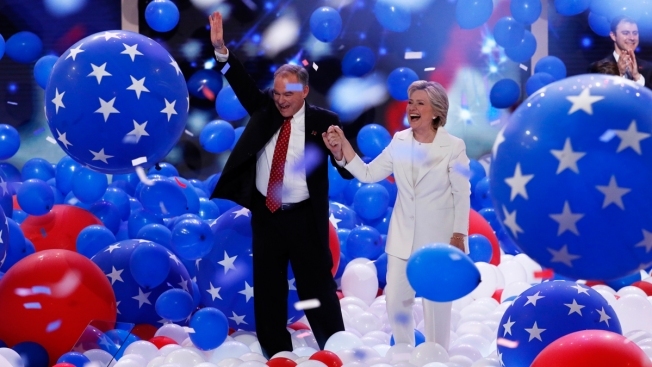 Democratic vice presidential nominee Sen. Tim Kaine, D-Va., and Democratic presidential nominee Hillary Clinton walk through the falling balloons during the final day of the Democratic National Convention in Philadelphia, July 28, 2016. The committee that raised money for last summer's Democratic National Convention in Philadelphia used surplus funds to hand out nearly $1 million in bonuses for staff members as well as grants for Philadelphia schools and nonprofits, rankling some state lawmakers who ponied up $10 million in tax dollars for the event. The bonuses to the host committee staff came from a $4 million post-convention surplus and were disclosed in a Jan. 31 filing with the Federal Election Commission. They were first reported by The Philadelphia Inquirer. All told, the committee raised $86 million in public and private money. Former Pennsylvania Gov. Ed Rendell, the host committee's chairman, called the bonuses a reward for low pay and long hours. The 12 bonuses ranged from $500 up to $310,000 for the committee's executive director, Kevin Washo, whose committee salary was $13,000 a month for two years. Rendell told the Inquirer that Washo's payment was part bonus and part back pay for unpaid work he did in 2013 through early 2015 when a small team worked to get the Democratic National Committee to select Philadelphia for its convention. Washo said the payouts were decided by him, Rendell and chief operating officer Eliza Rose, who received a $43,000 bonus. The committee's chief finance officer, Jason O'Malley, paid about $8,000 a month, received a $220,000 bonus. O'Malley's fundraising work deserved a "performance bonus," Rendell said. The committee's largest charitable contribution, $750,000, went to the Philadelphia School District's Right Books Campaign. Other city nonprofit groups received grants of $10,000 or $25,000 from the committee, which also repaid the city $500,000 for its costs, Washo said. The state's $10 million grant, requested by Democratic Gov. Tom Wolf from lawmakers, was the largest convention donation. The grant money was kept in a separate account from the millions raised from private donors, and covered costs approved by the state, Washo said. The state dollars were to go toward renting the convention center in Philadelphia and construction there, all spent in July, according to an independent auditor's report. The state Senate's ranking member, President Pro Tempore Joe Scarnati, R-Jefferson, will seek an audit of the money by Pennsylvania's independently elected auditor general, his office said. The host committee apparently didn't need the entire $10 million from the state and should have approached Wolf's office and lawmakers about returning what it didn't need, Scarnati's chief of staff, Drew Crompton, said. "They had at least $4 million more than they needed and, even if it was after the fact, they can certainly return a portion to the commonwealth," Crompton said.